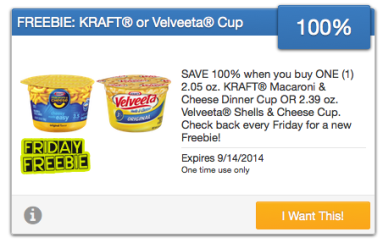 Today’s Freebie Friday deal over at SavingStar.com is for 100% back when you buy one Kraft Macaroni & Cheese Dinner Cup 2.05 oz or Velveeta Shells & Cheese Cup 2.39 oz. – valid through 9/14 only. Just purchase it and then submit your receipt and the money will be added to your account!